During construction for the Shelby White and Leon Levy Lod Mosaic Center, a new and impressive mosaic was uncovered dating to the 4th Century CE. Since their discovery in 1996, the exceptional mosaics at Lod have captured world-wide interest. Known for their variety of color and exceptional quality, the mosaics were assembled 1,700 years ago as the floors of a luxurious Roman villa. This past month the Israel Antiquities Authority (IAA) uncovered another stunning mosaic while preparing for the construction of The Shelby White and Leon Levy Lod Mosaic Center. 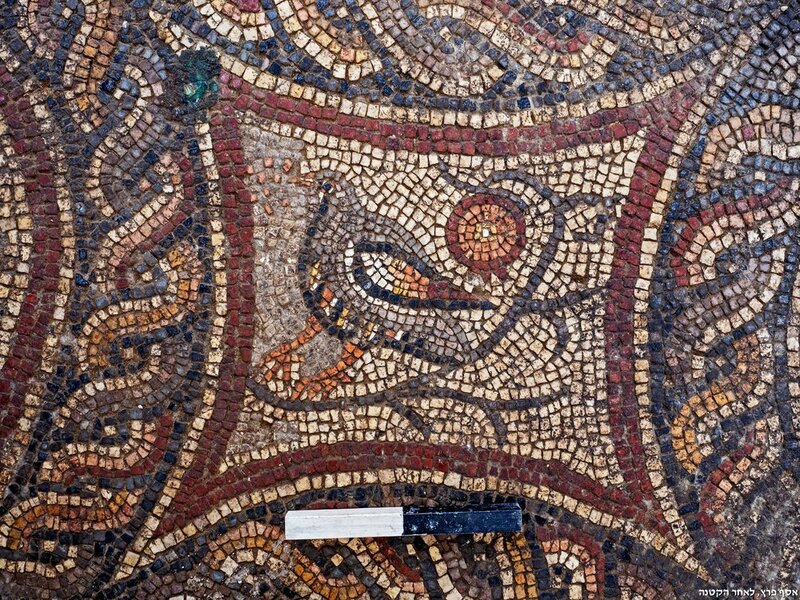 Consistent with the mosaics previously discovered, this colorful floor depicts zoomorphic images such as fish and winged creatures. The style and imagery of this mosaic, which is known mostly in the Western part of the Roman Empire, is similar to that of a mosaic discovered on Mt. Zion Jerusalem. Gorzalczany says that “It is quite probable that the same artist produced both the mosaics, or that two artists worked from a similar design.” Unlike the Mt. Zion mosaic, however, the floors at Lod do not depict human figures. It is possible that this indicates the owners of the house were Jews. Aside from the colorful creatures, the mosaic also includes rectangular marks similar to others seen at cites such as Zippori. These marks would have indicated where couches ought to be placed during a banquet. The mosaic was expertly removed this week by the Conservation Department of the IAA, under the supervision of the Head of the Artistic Conservation Branch Jacques Neguer, and the Head of the Mosaics Department Galeb Abu-Diab. After conservation the mosaic will be displayed within The Shelby White and Leon Levy Lod Mosaic Center. The Center is a joint initiative of Shelby White and the Leon Levy Foundation, the Lod Municipality, the Lod Economic Development Corporation and the IAA. The Center will display the extraordinary mosaics as well as other artifacts from the excavations at Lod within a structure inspired by the plan of the original villa. Located near Ben Gurion International Airport, it is hoped that this project is the first of many to draw visitors to the historic site of Lod. The conservation experts prepare to remove the mosaic for conservation. When the Visitors’ Center is erected the mosaic will be displayed. Photos: Raleb Abu Diab, IAA. Newer PostDid Ancient Potters Play Backgammon?